As a youngster in Switzerland, Ray Vetsch dreamed of being an astronaut. The problem was, Switzerland had no space program. Instead, he became a heart surgeon. The physician repairs hearts at Freeman Hospital West in Joplin, and the pilot will perform at the Joplin Airfest 2000 on July 22 and 23. He said he flew gliders in Switzerland when he was young because learning to fly with motorized planes was too expensive. "I was flying gliders in Europe," Vetsch said. 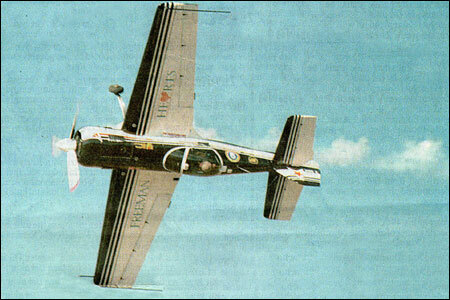 "Part of the glider education also included some aerobatic maneuvers. I was really excited about that." He said in 1977, at age 16, he began flying motorized planes with some of the best aerobatics pilots in Europe and the United States. "Some very high caliber aerobatics pilots took me under their wings," he said. "I was a pilot before I was a doctor," Vetsch said. "I put myself through medical school flying air charters and touring the Alps." When he entered medical school, Vetsch said he committed himself to becoming a hear surgeon or have no medical career at all. He believed his manual dexterity qualified him to be a heart surgeon. "Heart surgery was the most demanding thing I could think of," Vetsch said. "In my younger years, it was the highest challenge to go for. That, by itself, was the best reason to pursue it." Vetsch said he has always been one to push himself and encourages others to challenge themselves. "I excel dealing with challenges, and I enjoy taking responsibility," Vetsch said. " I also feel that everybody should try to work and achieve the highest level of their potential. I just felt very blessed to have good hands and eyes." Vetsch first came to the United States as an exchange student in 1973. He moved here permanently in 1984 and became an American citizen. He joined the Freeman heart program two years ago, as it was getting under way. He said he looked at the job as another challenge. Vetsch said on a recent week he performed eight or nine heart surgeries, but the number varies from week to week. He also has trained himself in a surgical procedure that allows pilots to continue flying after the surgery. The Ross Procedure is a method of transplanting a heart valve that does not require the patient to use blood thinners. The Federal Aviation Administration bars people on blood thinners from flying. "I'm the only guy here in the region who does valve transplantations of this sort," Vetsch said. He said he gets away from his medical practice twice a week to practice aerobatics at the Joplin Regional Airport. He flies in about 10 air shows a year. 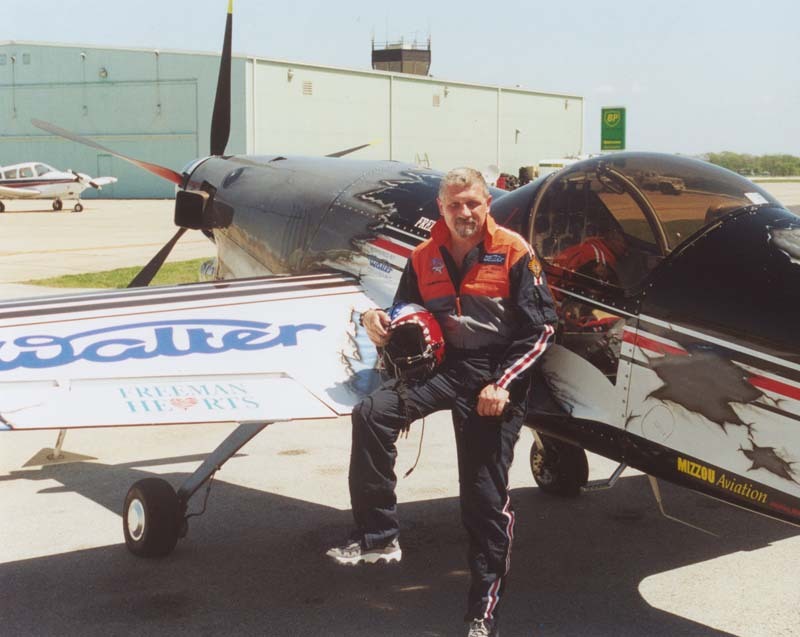 Freeman Heart Institute sponsors his air show performances. Vetsch practices on the north end of the runway and said the airport staff has been very helpful and accommodating. He said he could not practice with the frequency he does in Joplin at many other airports. "A lot of my air show friends are very jealous," he said. Vetsch flies a Russian Sukhoi 26MX. "It is very high-performance, 360 horsepower," Vetsch said. "It is a very unstable, fast-rolling plane. It allows you to do just about any maneuver you can think of. It is, however, a difficult plane to fly. The inherent instability allows it to be as agile as it is." He also drives motorcycles, something he said he has done all his life. He also integrates his motorcycle driving into air shows, as he displayed at the Neosho Air Show last month. Vetsch drove a motorcycle with passenger Kyle Franklin. Franklin climbed a ladder attached to a plane piloted by his father, Jim Franklin. "He needed a driver, and I was around," Vetsch said. Jim Franklin is a patient of Vetsch's who underwent the Ross Procedure that allowed him to continue flying. Vetsch said contrary to what everyone probably thinks, he is not a risk-taker. "Everything we do takes a lot of discipline and focus and planning," Vetsch said. "Everything you do, you have escape plans and redundancies. This risk is very much calculated and kept low. "It is probably more risky than stamp collection," he added. "Most air show pilots are very disciplined and focused and don't take chances." Asked if he had looked at the opportunities to become an astronaut recently, the 45-year-old Vetsch responded: "I'm an old man, now." Reminded that John Glenn returned to space in 1998 at age 77, Vetsch said Glenn is a hero of his. Vetsch is on the web at www.sky-acro.com. An estimated 175,000 to 200,000 people showed up Sunday for the Kansas City Aviation Expo and Airshow's last day. More buses were used to transport the large number of attendees, after crowds overwhelmed the show's shuttle bus system on Saturday. Blue skies and the U.S. Navy's Blue Angels drew another throng that oohed and aahed at the thunder of close flybys Sunday at Kansas City's Downtown Airport. The precision flying team had its second performance of the weekend, as did the U.S. Army Golden Knights and other acts lined up for the seventh annual Kansas City Aviation Expo and Airshow. The crowd was estimated between 175,000 and 200,000. That was large enough to cause at least half-hour waits for people boarding buses leaving the show after the Blue Angels' performance, even with buses picking up new loads every five or 10 minutes. But the event did run smoother than on Saturday, when a larger than-expected crowd of about 200,000 overwhelmed the number of buses chartered to carry spectators to the show, causing delays in getting them to the airport from downtown pickup points. The number of available buses Sunday morning was more than 70, an airshow spokeswoman said. Even so, a steady stream of people walked to and from the show by crossing the Broadway Bridge. Riders on the buses said there were no delays in the morning runs. "It was well worth the $2," said Mitch McWilliams of Raytown, who rode the bus from 16th Street and Grand Boulevard. The morning trip took only a few minutes. The show delivered on its promises of sensational precise flying, as it had on Saturday. Along with more well-known performers, the crowd got to see the power of a unique plane being customized by Ray Vetsch, a cardiac surgeon from Joplin. The plane was a Russian model called the Sukhoi with a Czechoslovakian turbine engine that can generate 740 horsepower. Vetsch's team is in the process of design modifications to boost its output to 900 horsepower. The "turbo-shark" plane can climb 6,500 feet in a minute and has as much muscle, comparing weight to horsepower, as jets at the show, Vetsch said. He needed only a handful of yards before the speedy aircraft left the runway an he accelerated to shoot straight into the sky. Even when idling, Vetsch said, the propeller spins too fast for him to make a normal landing. He first must touch down with rear wheel and line up his descent on the runway and next reverse the propellers to slow down. "It's pretty dicey. You have to be really focused to get it right," Vetsch said. It's 2 a.m. They have packed everything they need for the last leg of the journey. With headlamps illuminating the trail, they set out on a four-hour trek to Gilman's Point, where the air will be thin and very, very cold. At 18,640 feet, Gilman's Point is within striking distance of Uhuru Peak, the highest point on snowy Mount Kilimanjaro, the tallest free-standing mountain in the world. Sean Vetsch, a 12-year-old student from Memorial Middle School in Joplin, is climbing with his father, Ray, and a group that includes, John Cox, his 24-year-old son, Justin, and friends Steve Wade and Mike Anderson. They have an experienced African guide with them. Over the past three days, they have climbed the mountain in stages. From an elevation of 5,900 feet, they have traversed five distinct climate zones, ranging from a lush rain forest to a rocky alpine desert. What they would discover at the end of their journey is that Sean Vetsch would achieve something that no one else his age has ever achieved. "They start you out at 2 a.m. in the dark for a reason. It's mental. They don't want you to see the top. It would look so far away in the daylight you would not want to go," the young climber says. "You can walk a couple of hours, but the air is so thin and it is so cold it seems like you have covered only a short distance," he said. "You couldn't stop because that would slow you down even more. Your joints would freeze up." "You really did not want to stop. You did not want to stop producing body heat." Fighting bone-shilling wind chils, the group battles a serious problem with their most precious commodity - water. It keeps freezing. "The water weighed you down a little, but if you did not drink every couple of minutes to keep hydrated, you would be toast." To prevent their water bottles from freezing, they place their water bottles on their bodies. To keep their bodies from freezing, they layer on the clothing. "In the pictures, we look like we are really chubby because of all the layers of clothing we have on," he said. By the time they reach Gilman's Piont, they are seeing the sun rize over Africa and the bright ice caps of Mount Kilimanjaro. The icefield is shrinking because of global warming. Eighty-two percent of the icefield has vanished since it was first mapped in 1912. At the current rate, it will be gone in 20 years. The water coming form the glaciers was put there thousands of years ago. At Gilman's Point, they also see how much farther they have to go to reach Uhuru Peak. Shrouded in the clouds and rising 19,340 feet above the African plains stands Mount Kilimanjaro, a volcano that is the highest mountain in Africa. It's location, 200 miles south of the equator, and its massive presence influence the climate, vegetation and animal life of the region. There are six main routes to the top of the mountain which was first summited in 1889. The group from Joplin chooses the Marangu route, which can take you to the summit in four days. Day 1 - The climbers meet their guide and begin hiking from Marangu Gate at 5,900 feet. They hike through a rain forest to Mandara Hut at 9,000 feet, where the food is prepared for them and they will spend the night. Sean Vetsch siad, "The animals were interesting. They were friendly. You had to be careful with your food or they would come after it. There were monkeys and interesting birds because it was more of a jungle. It changed really fast after you left there." Day 2 - The climbers hike tot he Horombo Hut at 12,000 feet. They leave the last glades of the forest and hike an ascending path across on open alpine meadow or moorland. The air becomes noticeably thinner. They have dinner and stay overnight at the hut. Said Vetsch: "We changed environments real fast again. It had not been that difficult yet, but it was work. It was more of a desert area and rockier. We saw different plants, plants from a colder climate. It started to get harder to breathe as well. It got colder. Day 3 - The climbers hike slowly through an alpine desert to Kibo Hut at 15,400 feet. They have dinner and stay overnight at the hut. "It was a lot more rugged. In the first hour or so, we saw plants that close up at night and open in the day. An hour into it we saw more rocks and a few bushes here and there. It was like a desert," said Vetsch. Day 4 - The climbers are awakened at midnight and are given two hours to prepare for the trek to Gilman's Point at 18,640 feet. After four hours of strenuous climbing, they reac the point at sunrise. They must continue for another hour to reach Uhuru peak at 19,340 feet. "We saw the peak and we felt we could make it, but the altitude was gettign to us. We fealt we could do it, but we though about how cold it looked up there. The air was so thin and it was so cold. The altitude was really starting to get to us." After reaching the summit, they descend to Kibo Hut and then to Horombo Hut, where they spend the night. Day 5 - They descend from Horombo to Marangu Gate. Bobby Younkin debuted the world’s first aerobatic Learjet at Sun ‘n Fun, creating an enthusiastic if incredulous buzz among spectators. Ray Vetsch also flew his new airplane for the first time during Sun ‘n Fun week – a single seat Sukhoi 26MX "Shark" powered by a 750 h.p. Walter turbine engine that generates 2,800 pounds of thrust from a five-blade prop. Members of the U.S. Aerobatic Team participated each day and showcased their colorful aircraft and outstanding flying skills. Several of the popular "Heritage Flights" featured the F-16, F-86 and TF-51 aircraft. Sun ‘n Fun’s air show, sponsored by ExxonMobil’s Elite products, also included perennial favorites such as Patty Wagstaff, Jimmy Franklin, Mike Goulian, John Mohr, Steve Oliver, Walt Pierce, Dale Snodgrass, Charlie Kulp, the EAA Warbirds of America, Jimmy Rossi, the Aeroshell Team, Nikolai Timofeev, Manfred Radius, Bill Leff, Matt Chapman, Jim Leroy, Dan Buchanan, Mary Dilda, Randy Henderson, the Blue Sky Parabatics, Lee Lauderback, Fred Cabanas, Bob Davis, Bud Walker, Greg Poe, Bob Wagner, Dan McClung and a host of others. Sun ‘n Fun’s spectacular night air show was again well received. And in what may have been an aviation first, Monday’s air show included the sight of Space Shuttle "Atlantis" launching from the Kennedy Space Center nearly 75 miles to the east, with the orbiter’s exhaust clearly visible in the late afternoon sky. Joplin heart surgeon flies aerobatic plane. 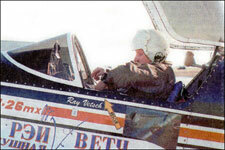 For fifteen minutes Ray Vetsch can take his Sukhoi in every which way. Once the Joplin man hits the end of a runway at the Joplin Regional Airport and lifts off the ground, it’s not long before his Russian-made aerobatics plane is twisting, bending and giving the appearance that it’s gone completely out of control. But that’s far from true. In fact, the Freeman Health Systems heart surgeon is in total control. "There’s no margin of error," said Vetsch, "zero room for mistakes." "And there’s no margin for error in heart surgery either." Vetsch, a native of Switzerland, who began flying gliders in The Swiss Alps at age 16, has spent much of the past 25 years spinning in his airplane, rolling it and doing loop-the-loops. Every maneuver is planned in the 10 to 12 air shows and aerobatics demonstrations he does each year. "The movies don’t show that it’s a workout," said Vetsch. "It’s like bench-pressing. And I’m absolutely drenched." Vetsch considers himself a man with two callings. At his office near Freeman Hospital West are signs of his life as a stunt pilot and a heart surgeon. For instance, Vetsch carries a pager that could beep at any moment, calling him away for the next heart surgery. On his office walls, however, are mostly signs of his life as a pilot. There’s a photograph of the Thunderbird, the famous flying Air Force pilots that use the F-16 and there are pictures of Vetsch’s plane, a small-but-heavy Sukhoi-26mx, that he bought 3 ½ years ago. "It was designed by its Russian manufacturer about 12 years ago", Vetsch said. "You can do outrageous maneuvers because of its instability," he said. "Once you fly this, there is no substitute." There is a link, Vetsch insists, between aerobatic flying and heart surgery. "I’m into precision in focus," said Vetsch, 43. "That’s how I operate and that’s how I fly. I thrive on focus and precision. A patient forms a trust with me. He trusts me with his life. If you apply the same traits to flying, I trust myself to fly in a different arena." Long before the air shows he’ll take part in this summer, Vetsch starts to plan. He’s doing much of that these days. On paper, he uses a mix of physics and an understanding of the body’s physical endurance capabilities to figure out which maneuvers he can do best in combination. "It takes such a large amount of physical energy to do some tricks that a stunt pilot sometimes needs a less-strenuous trick before returning to the most difficult moves," he said. Within weeks, Vetsch will have his aerobatics tricks planned and then he’ll practice often before the summertime air shows. Last year’s 15-minute-performance included 30 or so rolls, a loop, half loops and other tricks. His plane will fly up to 300 mph, and he must pace himself in order to physically make it through each of the steps. During his performance to the sounds of jazz musician David Sanborn, his 360-horsepower plane reaches heights of up to 2,000 feet. At its low point, the Sukhoi is just 50 feet off the ground. He’s performed at air shows and demonstrated his skills at Grove, Enid, and Muskogee in Oklahoma, Santa Fe, NM, Page, Ariz., and West Plains, MO. He rarely takes part in air shows in big cities. 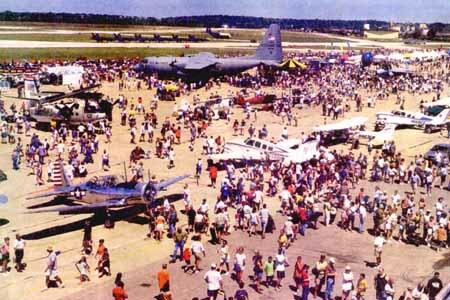 Late last year, Vetsch encouraged the Joplin Airport Board to plan an air show in 1999 at the Joplin Regional Airport, but the board thought otherwise, opting to prepare for a show in the summer 2000. "I fly to entertain people," said Vetsch, who moved to the U.S. permanently in 1984 after spending time in Minnesota as an exchange student in the 1970’s. "In air shows, the first job is to entertain people." "Anybody can do this, but you’ve got to learn to do it. If you stay with it, you can reach any goal." As he does his tricks at the shows, a small version of his aerobatics performance is always in front of him. Hand drawn symbols that represent the tricks he’ll do spell out his plan in an order. "You practice a sequence, a creation of yours," Vetsch said. "It has to have entertainment value, and it has to have safety. It takes the right speed, the right altitude and the right angle to make it work. "You don’t just fly ad hoc." If there’s even a doubt about which trick comes next, he stops, straightens out his plane and figures out what went wrong. "You don’t guess or think you know," Vetsch said. "You have to know. Exactly." Pilot Ray Vetsch, Joplin, Mo., waves to the crowd following his aerobatics performance at the ninth annual Fort Scott Days on Saturday. After David Clyman surveyed a U.S. Army 64 Alpha Apache attack helicopter, he said. "I'm glad that thing is on my side." The Nevada, Mo., resident was one of the thousands of people who spent Saturday observing and admiring aircraft at the ninth annual Fort Scott Airport south of the city. It was Clyman's first time at the event. The daylong air show included performances by seven aerobatic pilots along with military airplane flyovers that wowed the crowd. The event also included a host of military equipment displays like to two Marine H-1 Hummers along with Harley-Davidson motorcycles and vintage cars. Many of the aerobatic pilots like Guy Baldwin and Randy Harris have been performing at the event for several years, but a new pilot, Jaquie Warda, captured tge audience's attention with her performance. Warda became the first female aerobatic pilot to participate at the air show. She said the greatest aspect of participating at air shows, next to the heart-pounding excitementof flying, is the children's reactions. "Big kids or little kids, they're just in awe of what we do, because it's so different from what they do, said Warda, who is the first female aerobatic performer after turning 50 years old and following a career in the legal profession. "It's fun to see the kids get so exciteed." The Danville, Calif., native shared some insight into the realm of aerobatics. She practices maneuvers every day, sometimes two to three times a day, for 20-30 minutes each day, for a year before attempting them at an air show. "It's hours of training to get it right," Warda said. Even with continous training, things can go wrong. In May 2005, a propeller broke on Warda's plane, semding her out of control. She landed it in a pasture. "I thought i was going to die," Warda said. When something goes wrong, the pilot has yo make quick decisions and have knowledge of how to handle the problem, she added. No equipment malfunction occured Saturday, when Wardatumbled and twisted in the overcast sky in her Pitt special bi-plane, which she purchased for around $60,000. This year's event drew more people than any of the previous eight, although organizers didn't track the number of people who attend, event chairman Bob Marshall said. The weather had positive and negative aspects. Cooler than average temperatures probably led to a bigger turbout, but the threat of rain kept many privot pilots who usually fly in to display there airplanes home, Marshall said. Most of the airplanes are flown by "weekend pilots" who don't have the necessary equipment and don't want to risk flying in bad weather, he said. "It's important for the community to realize what we have, what a real positive commodity that the airport is for the city," Marshall said. "It makes them realize that there's something out here. It's not just a name they see in the paper or the phone book. It produces pride in the community." The evnt took about $8,000 to put on. Last year, staff spent $6,000, but they added Warda at the last minute, and that raised the price tag, Marshall said. No tax dollars funded the event, Marshall said. Forty-Four area businesses helped sponsor the daylong event, and 13 additional businesses provided goods and services. Will Freeman heart surgeon’s stunts be heart-stopping? It’s 120 degrees in the cockpit, and he’s squeezed by up to plus-9 G’s as he loops and rolls the Russian-made Turbo Shark fighter plane. When he climbs out of his extreme-powered stunt plane, Dr. Raymond Vetsch has lost three pounds in the eight minutes he’s been in the air because of the G-force workout he gets. “It is a pretty wild airplane to fly,” Vetsch said. The plane, informally called Turbo Shark, is technically a Sukhoi 26mx built for the Russian military with a Walter M601T turboprop jet engine that he has specially modified to increase horsepower. Vetsch advertises on his Web site — www.turbo-shark.com — that the Turbo Shark performances he does at air shows in the Midwest and South are accomplished with surgical precision. They have to be — in order for him to survive. There is no margin for error when he’s pushing a machine at speeds of up to 280 mph and climbing heights at 6,500 feet per minute. He also pilots with surgical precision because he is a surgeon. Vetsch is a heart surgeon at the Freeman Heart and Vascular Institute, which helps sponsor his hair-curling hobby. Vetsch will be one of the performers at Airfest Joplin, slated for Friday and Saturday at the Joplin Regional Airport. In fact, Vetsch seven years ago encouraged local pilots and airport officials to start the air show. Though he’s a dedicated performer who does up to a couple of dozen shows a year, he hasn’t done any yet this year. He said he’s saving his vacation time this year to get married and honeymoon in July, and for some other air shows in September and October. If weather permits, he will fly in another air show in Winfield, Kan., the same day he appears at the Joplin show. He usually practices his stunts twice a week, but he has not done so this year because there have been so many rainy days. “The weather is making it a little bit hard on me” to get in as many flights as usual, he said. Vetsch choreographs his eight-minute show to allow for as many thrills as possible for viewers, but also to perform safely. Capabilities of the aircraft and the pilot’s body, and the physics of the forces at work in the air all have to be considered in staging what moves to make and how closely together stunts can be performed. Another plane Vetsch owns, an Air 39 Albatross, will be among the static displays at this year’s show. The plane was in bad shape when he bought it, he said, and he’s had it refurbished. “We spiffed it all up,” he said. “It flies very well. It’s just a great airplane.” It’s painted with the Swiss Air Force coat of arms, a tribute to Vetsch’s homeland. He was born in Switzerland, came to the United States to go to school and then stayed, becoming a U.S. citizen. He became interested in flying as a boy and started flying gliders at 16 in the Swiss Alps. He paid his way through medical school by working as a pilot flying tourists through the Alps on sightseeing trips. Vetsch is among eight stunt acts scheduled for this year’s air show. Also lined up are concerts by Christian recording artist Rebecca St. James on Friday night and the 1950s rock ’n’ roll band Coupe De Ville on Saturday night. This year’s show will honor women who served in the military. Members of the Women Airforce Service Pilots will be special guests at the show.